The gold miner is a little stretched to the upside at the moment, but should present a buying opportunity on a modest pullback. In his first Executive Decision segment on "Mad Money" Thursday, Jim Cramer spoke with Tony Makuch, president and CEO of Kirkland Lake Gold Ltd. (KL) . Kirkland Lake Gold is a gold miner with shares that have doubled since mid-2017, and we looked at its charts late last year. Makuch said Kirkland Lake Gold has had strong growth in earnings per share and the company continues to increase production with higher grades of gold, making that increased production even more valuable. Makuch noted that sometimes the best place to look for gold is right where you've already found it. That has been the case in Australia, where additional reserves have been located. Turning to the topic of consolidation, Makuch said no matter what size company you are, merging allows you to invest differently, putting more money to work in profitable mines and being able to close unprofitable ones. That covers most of the fundamental bases, so let's round out our analysis with the latest charts and indicators for KL. In this daily bar chart of KL, below, we can see that prices have continued to creep higher. KL is still above the rising 50-day moving average line and the rising 200-day line. Volume has been average and the daily On-Balance-Volume (OBV) line has been neutral. The Moving Average Convergence Divergence (MACD) oscillator has crossed to the downside for a take-profits sell signal on this time frame. In this weekly bar chart of KL, below, we can see an impressive rally over the past three years. The stock is trading above the rising 40-week moving average line. The weekly OBV line is in a strong uptrend and so is the MACD oscillator. 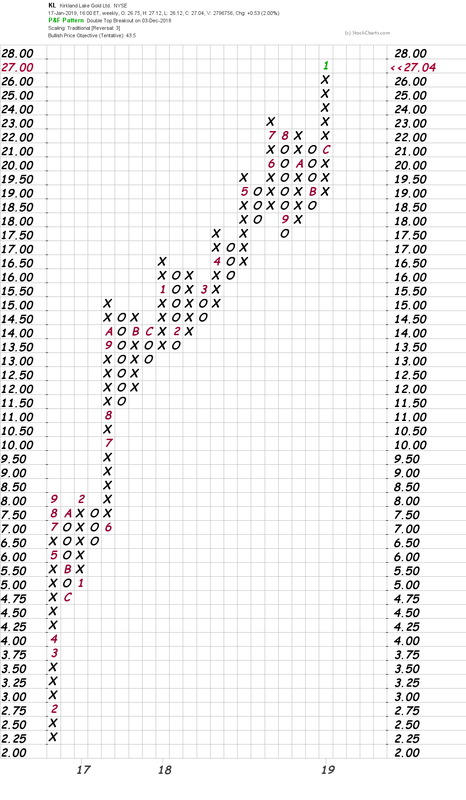 In this Point and Figure chart of KL, below, we can see the projection of a new upside price target of $43. Last month the chart indicated a $37 target..
Bottom line strategy: KL is a little stretched to the upside, or what some would call overbought. Continue to hold longs from last month and continue to risk below $22 for now. If KL pulls back to $24 it probably will be a buying opportunity. Price targets are $37 and $43.